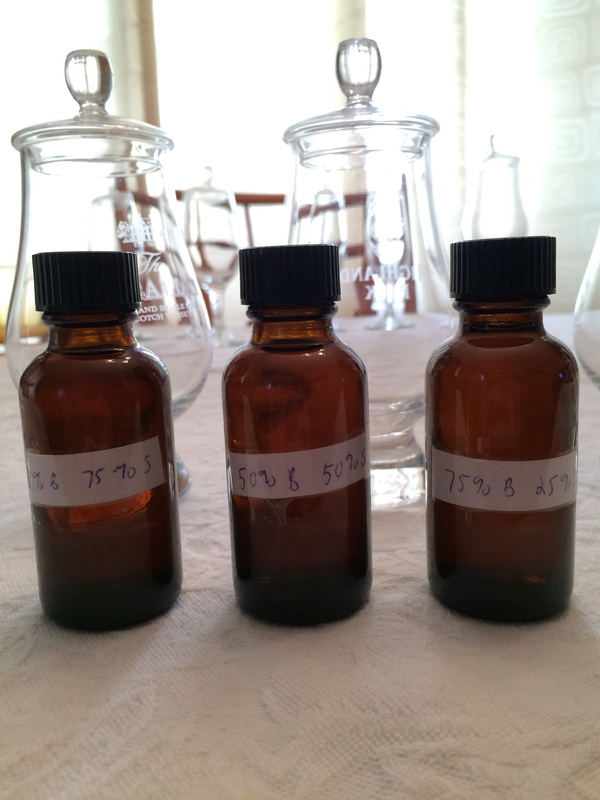 Welcome to the inaugural experiment from the Single Malt Savvy Laboratories. When The Balvenie released their 15 year old Single Sherry Cask in 2014, I soon realized that they afforded me the ability to do a very interesting experiment. A great number of standard OB whisky releases are made up of a percentage of ex-bourbon cask whisky vatted together with a percentage of ex-Sherry cask whisky. As consumers, we don’t have much say in what goes into each release. In this case, however, I was able to take matters into my own hands and answer a very intriguing question: What’s the best proportion of ex-bourbon to ex-sherry Balvenie? To start, I opened two sealed bottles of Balvenie: a bottle of Single Sherry Cask 15 Year (Cask #4443) and a bottle of the now-discontinued Single (refill) Barrel 15 Year (Cask 15239). I created three samples in 2 oz. bottles. The first was 75% Bourbon to 25% Sherry. The second was an even 50/50 split. The third was 25% Bourbon to 75% Sherry. I let these new creations sit for 10 days to marry before tasting. To gain some additional perspective on this experiment, I invited my brother (and partner-in-crime) to help me taste these three new creations along with a sample of the unblended 100% Bourbon and 100% Sherry releases. 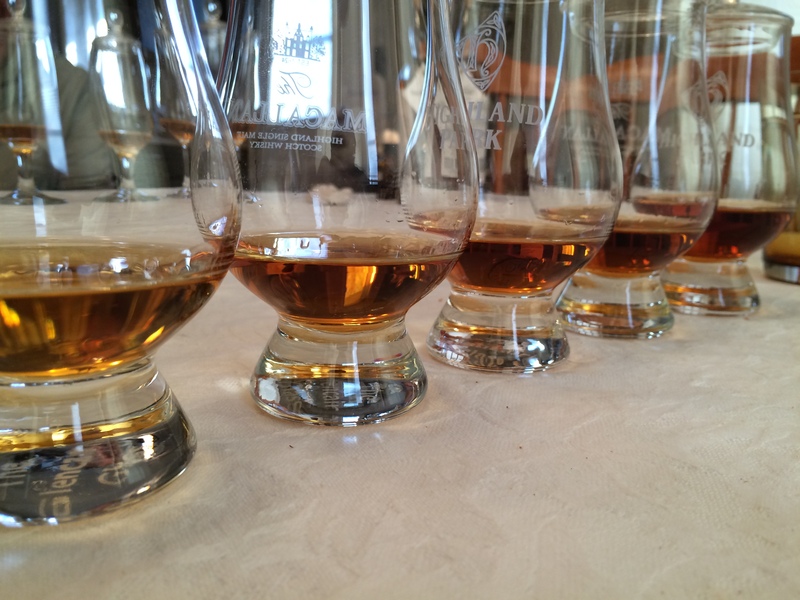 No matter the proportions, each of the 5 samples was matured for 15 years in each respective cask type. Each of the 5 samples is 47.8% ABV. Each of the 5 samples is still a 15 Year Balvenie single malt as they are all still from one distillery. Because of this, most of the same core tasting notes will appear in all 5 samples. Each sample came from bottles opened at the same time so oxidation isn’t a factor. We did a pass working from the most bourbon to the least bourbon. We then did a second pass going from the most sherry to the least sherry for different starting points of comparison. The two of us didn’t discuss preferences or favorites at all until we were done tasting to avoid influencing each other. One other thing to note: these were never designed to be full reviews. The notes listed are merely comparisons between the 5 different samples. I scored all 5 but won’t be including these scores in this post. With that out of the way, on to the notes! Nose Heavy on the vanilla and honey. Fresh fruits, apple, slightly minty. Hints of citrus. Taste Fresh fruit, floral, honey, nice vanilla. With water, more fruit. Wood and vanilla in the forefront. Finish Nice blast of spice, cloves, some oak. Fresh and crisp with water. Good stuff. Overall Thoughts The standard I’ve come to know and love over the years. Nose Wow. Even 25% sherry makes a HUGE difference. Slightly less of the fresh notes, the citrus is masked by red berries. Taste Light fruits, not as fresh tasting as the 100% Bourbon. Some light spice. Some citrus, but not quite enough to make it work. Grapes/winey. Water doesn’t help. It’s a little bit of everything, but not enough in any one area. Finish Cinnamon and nutmeg on the finish. With water, hints of cooked fruits and typical Balvenie honey. Short and a bit sour at the end. Overall Thoughts I don’t know how else to say it: this proportion just doesn’t work. It’s sorta fresh but not really. It’s sorta spicy but not really. If I didn’t blend this myself, I’d never believe that this was all Balvenie. Nose Spicier and bolder. Interestingly, the mintiness is back more in this proportion. Taste A better balance for sure. I can taste sherry influence for sure. Spice, red fruits, a bit of raisin/dried cherries. With more water, the most citrus of the experiment. Interesting. Finish A nice, sweet, oaky finish. The longest finish so far as well. Honey sweetness, dried fruits for sure, hints of syrupy cooked fruits as well. With water, this STILL has the longest finish. A LOT of influence from the bourbon barrel with water as well. Overall Thoughts This is leaps and bounds better than the 75% Bourbon to 25% Sherry blend. This was also the most unique of the 3 blends. Nose Unsurprisingly, this is the first one that screams “sherry” to me. The vanilla is much harder to find here. Hints of citrus still prevail. With water, this retains well-balanced sweetness, fruitness, and spice. Taste Lots of unexpected complexity. More wood, more spice, vanilla, honey, it’s all there. With water, this is by far the best palate of the experiment. The vanilla and wood are there with the right amounts of honey and spice. Finish Christmas spices, the driest finish so far. With water, a really nice oak note. Lots of wood in fact. Some pencil shavings as well. Overall Thoughts It’s the same stuff that went in every other sample but this is by far the most balanced and complex. Amazing. Nose Dried fruits, molasses, big spice. Big on the raisins. With water, a maple syrup notes emerges. Finish The thickest finish, mouth coating, lots of spice and berries. Oloroso sherry notes. With water, cherry cough drops. Also, I found the vanilla again! Overall Thoughts I love this expression almost as much as I love the discontinued ex-Bourbon 15 Year Single Barrel. It really just depends on what type of Balvenie I'm in the mood for. Without hesitation, there was a clear-cut loser for both of us immediately. We were really surprised at just how completely different each sample was by varying the proportions. It really makes me appreciate what Malt Masters/Master Blenders do. We both found that only one blend was greater than the sum of its parts. Speaking for myself only, I found that 2nd, 3rd, and 4th place were really close score-wise. My top choice and bottom choice were both clear-cut and far above and below the middle of the pack respectively. We used ex-Refill Bourbon in this experiment. What would have happened if we used the 12 Year First Fill Single Barrel? What about ex-Refill Bourbon with more age to it like the 25 Year Single Barrel. What about a recreation of the Founder’s Reserve/Signature with a little bit of all three? The possibilities are endless really. There you have it. Depending on who you ask, either a 50/50 split or a 75% sherry proportion is the “best” combination for The Balvenie. I wonder what would happen if we split the difference and tried a 60-65% sherry blend. I think it’s interesting to note that the only Balvenie releases I know of that definitely have this level of sherry proportion are the absolutely stellar Tun 1401 releases. Coincidence? Maybe, but it’s worth mentioning. Thanks for reading!